There are moments in people’s lives which are defining moments. In one micro-second of time, something shifts deeply. Suddenly, something impossible is not only possible, it is actually happening—something that transforms us for the rest of our lives. Some transforming moments are not good ones—we are told that we have cancer or a chronic disease. We answer the phone and hear that someone we love has died. We hear—from someone we loved and trusted—that he or she wants a divorce. Yet sometimes, a transforming moment is wonderful. We fall immediately and deeply in love with someone at a party, then spend many good years together. We have an inexplicable spiritual conversion experience. We sit with a dying person and suddenly know the depth and mystery of holiness. Or after a long and difficult labor, a nurse or midwife places a tiny bit of humanity with a very red face and a head full of hair into our arms. In that split second, life is transformed. This morning, we celebrate one of those moments—the baptism of Amandine Mary, which is a transforming moment in her life—even though at this moment, she doesn’t know, or care! We also celebrate another transforming moment in someone’s life—without which Christmas would not have happened. We celebrate Mary, the mother of Jesus, who, in one transforming moment, said yes to God. This prayer has been uttered by millions of Christians for centuries. From popes to ordinary people. From desperate people who turn to her in prayer to those who adore her just because she is Mary. Just because she has been what the early Church fathers called “theotokos” or “God-bearer”—the woman who bore the Prince of Peace, the Light of lights. I did not grow up with Hail Mary’s on my lips—my Southern Baptist mama cast a highly cynical eye on anyone with a love for saints. However, through the years, I have grown to love Mary. I have learned to love her despite attempts from certain quarters in the Church to domesticate her. Gentle, sweet Mary, who bows her head in meek compliance to the Divine will? I think not. The Mary in Luke’s gospel is no whimpering doormat. 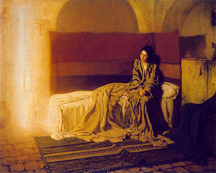 In the Annunciation story in the first chapter of Luke, the angel Gabriel comes to Mary. “Greetings, favored one! The Lord is with you.” Luke tells us that Mary is “much perplexed.” Well, I suppose I would be much perplexed if some big tall angel showed up in my house and began a conversation that way! Of course Mary is perplexed. Then Gabriel tells her that she will conceive and bear a son, describing this child in glorious language. Like most women, Mary’s initial reaction is practical. “How can this be?,” she asks. “I am a virgin.” Gabriel tells her that she will be overpowered by the Holy Spirit—which, I might point out, is a rather vague answer. That this son will be the holy one. That nothing is impossible with God. What happens next? Gabriel has to wait for Mary’s answer. Mary is a human being. She has a choice. She could say no. The choice is Mary’s. At the very moment she makes this decision, the world will be transformed—one way or another. Throughout the centuries, poets and artists have depicted this moment of time between Gabriel’s words and Mary’s response. It has been postulated that all the hosts of heaven stopped singing. Silence reigned while angels, archangels and hosts of heaven stopped. Listened. Waited for Mary’s answer. Would this innocent girl say yes to God? To say yes to God will mean human consequences. She and Joseph are betrothed, which in the first century is as legal as marriage. Mary has been promised to Joseph. However, he will not take Mary to his own home until their official wedding ceremony. When Joseph learns that she is pregnant before this ceremony, he has every right to refuse to marry her. In fact, by law, Mary could be stoned to death—although by the first century, very few such drastic acts were carried out. In any case, if Joseph refuses to marry her, Mary will spend the rest of her life raising her illegitimate son in her father’s home, ostracized by the whole village. If Mary says yes to God, her life will never be the same. Yet Mary shows incredible courage and strength. This is no Mary meek and mild. 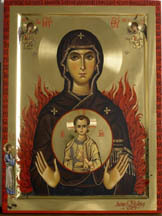 This is a Mary courageous and yes, even wild and powerful. Deep inside her, this strong young woman understands that nothing is impossible with God. Nothing. In a moment that transforms this young woman and the world, she chooses. “Here am I, the servant of the Lord; let it be with me according to your word.” The world is forever changed by a teenager who says yes to God. Mary has to process all of this incredible news, so she goes to visit her relative Elizabeth, who is also to bear a son. When Elizabeth hears Mary’s voice, she is filled with God’s spirit. “Blessed are you among women, and blessed is the fruit of your womb.” Mary responds to Elizabeth with a beautiful hymn we have come to call “the Magnificat.” Using the words of an Old Testament woman, Hannah, Mary sings a canticle in praise of God. “From now on all generations will call me blessed.” Then she moves us beyond her own situation into a larger realm of God’s possibilities. 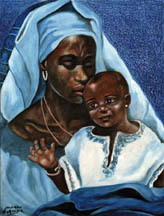 “For the mighty One has done great things for me, and holy is his name. . .He has filled the hungry with good things, and sent the rich away empty. . .” Mary is a young, poor woman from a working class family. In her world the rich get richer and the poor get poorer. Money counts. Politics count. Power counts. Caesar in Rome is called the son of God and treated as such. Yet out of a time of political power, corruption, lopsided economics, a poor teenager has the courage to say she will bear God’s child. She has the courage to sing with joy about a world that has not yet come into being—a world that with her decision, will someday—God willing—come to be reality. A world that you and I participate in, because you and I have moments in our lives in which we have the power, the choice, to say yes to God and no to the world. Today, this community of faith will witness such a moment. Today, these young parents bring their fifteen month old daughter to the waters of Holy Baptism. Because she is too young to make this choice on her own, they say yes to God on her behalf. They will promise to bring up this child in the Christian faith. In saying yes to God and having Amandine baptized, they have a responsibility. Not only will they encourage her as she grows stronger physically, mentally and emotionally, they will also have a spiritual responsibility. They must teach her how important it is to love God and to love her neighbor. They must teach her the 23rd Psalm and the Lord’s Prayer. They must find ways to nourish her spiritually in a community of faith. The waters of Holy Baptism are not for the meek and mild, because they change you. Forever. They are for those who hear the voice of God through something or someone who says “God wants to be in you. God wants to change the world through you. You are blessed and the Lord is with you. And if you think you are not a likely candidate, just think of that innocent poor teenager long ago, faced with a messenger from God and an incredible, life-changing moment. And just remember: nothing, nothing, nothing will be impossible with God. If somehow, someway, you are able to come face to face with Gabriel, what will be your response to God? Despite the fact that I “live with” the scriptures for any given up-coming Sunday as I do my morning devotions, there are times when a phrase or a sentence grabs my attention on Sunday as I hear it read. This morning was one of those times. As I listened to lay readers at both services read the epistle, one sentence grabbed my attention, and I’ve been thinking about it ever since. “Where righteousness is at home.” I checked my Greek-English interlinear Bible and found that this translation also says “where righteousness dwells.” Okay, that’s “at home” for me. We don’t talk much about righteousness in the 21st century. Sometimes you will hear someone called “self-righteous.” That, of course, is not a positive moniker. But I think that we have no clue what “righteous” really means. What is righteousness? It is related to law–a construct with which the classical and hellenistic Greek world was familiar. It involved religion, politics and ethics. Yet righteousness was also deeply engrained in the Jewish people’s (then, by extension, early Christian’s) hearts, stretching back to Moses and the Ten Commandments. If you kept God’s laws, God’s commandments, you were considered righteous. And the thought was that Jesus–who kept God’s laws most perfectly and in his whole nature–was the most perfect example of righteousness. Yet being righteous also related to being JUST. And that involved every person keeping God’s commandments to the best of his/her ability, striving to be like Jesus of Nazareth. “Where righteousness is at home.” I have been wondering this afternoon what that might look like in today’s world. At the moment, our culture is in the midst of a frenetic, jingle-belled shopping binge. Of course after the New Year, some of us will regret our spending. Yet what has been done, will have been done, and the cold reality of that credit card bill will sit on the dining room table. Keeping God’s laws–which I believe can be summed up in “love God and love your neighbor”–is pushed to the back burner as we get into the “spirit of Christmas.” Yes, we probably do some charitable giving this time of the year, and my own parish is currently collecting food and money so we can fill over 40 boxes with food for families of elementary school students over the holidays. That is a good thing, to give to others. But I wonder whether we give righteousness a temporary lodging or whether we give it a home. I want to be the kind of faithful person who–in the cold of mid-January–thinks about how I will live out the love of God as often as I might in mid-December. To live according to the way God really calls us to live might mean that we live intentionally in odd ways. For example, in this time of polarizing politics, of extreme rhetoric, of some who profess to know exactly what God wants or thinks, how can we–as faithful Christians–respond? In my own well-loved (and yes, adopted) tradition of the Episcopal Church, how can we join John the Baptist and cry out in the wilderness of people’s lives? How can we live the gospel with our lives? How can we invite others into the home of Christ’s love in real ways that make a difference in people’s lives? I wish I had all the answers. I do not. In fact, I find that the longer I live a life of faith, the more questions I have. Yet I remain hopeful. I want to be more faithful in loving God and in loving others the way I want to be loved. Totally. Unconditionally. Without judgment. That is so difficult. And that probably means that I will have to move the furniture in the home of my soul, to make room for another. Maybe today, I have moved a chair a quarter of an inch. It’s not much, but it’s a start.